This is the 13th book in the Tarzan Series and the 4th book in the Pellucidar Series. In response to a radio plea from Abner Perry, a scientist who with his friend David Innes has discovered the interior world of Pellucidar at the Earth's core, Jason Gridley launches an expedition to rescue Innes from the Korsars (corsairs), the scourge of the internal seas. He enlists Tarzan, and a fabulous airship is constructed to penetrate Pellucidar via the natural polar opening connecting the outer and inner worlds. TARZAN OF THE APES paused to listen and to sniff the air. Had you been there you could not have heard what he heard, or had you you could not have interpreted it. You could have smelled nothing but the mustiness of decaying vegetation, which blended with the aroma of growing things. 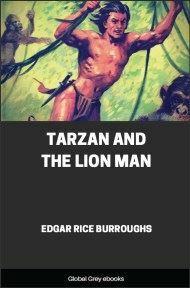 The sounds that Tarzan heard came from a great distance and were faint even to his ears, nor at first could he definitely ascribe them to their true source, though he conceived the impression that they heralded the coming of a party of men. Buto the rhinoceros, Tantor the elephant or Numa the lion might come and go through the forest without arousing more than the indifferent interest of the Lord of the Jungle, but when man came Tarzan investigated, for man alone of all creatures brings change and dissension and strife wheresoever he first sets foot. Reared to manhood among the great apes without knowledge of the existence of any other creatures like himself, Tarzan had since learned to anticipate with concern each fresh invasion of his jungle by these two-footed harbingers of strife. Among many races of men he had found friends, but this did not prevent him from questioning the purposes and the motives of whosoever entered his domain. And so today he moved silently through the middle terrace of his leafy way in the direction of the sounds that he had heard. As the distance closed between him and those he went to investigate, his keen ears cataloged the sound of padding, naked feet and the song of native carriers as they swung along beneath their heavy burdens. And then to his nostrils came the scent spoor of black men and with it, faintly, the suggestion of another scent, and Tarzan knew that a white man was on safari before the head of the column came in view along the wide, well marked game trail, above which the Lord of the Jungle waited. Near the head of the column marched a young white man, and when Tarzan's eyes had rested upon him for a moment as he swung along the trail they impressed their stamp of approval of the stranger within the ape-man's brain, for in common with many savage beasts and primitive men Tarzan possessed an uncanny instinct in judging aright the characters of strangers whom he met. 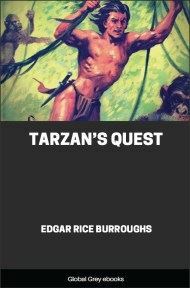 Turning about, Tarzan moved swiftly and silently through the trees until he was some little distance ahead of the marching safari, then he dropped down into the trail and awaited its coming. Rounding a curve in the trail the leading askari came in sight of him and when they saw him they halted and commenced to jabber excitedly, for these were men recruited in another district—men who did not know Tarzan of the Apes by sight. "I am Tarzan," announced the ape-man. "What do you in Tarzan's country?" Immediately the young man, who had halted abreast of his askari, advanced toward the ape-man. There was a smile upon his eager face. "You are Lord Greystoke?" he asked. "Here, I am Tarzan of the Apes," replied the foster son of Kala. "Then luck is certainly with me," said the young man, "for I have come all the way from Southern California to find you." "Who are you," demanded the ape-man, "and what do you want of Tarzan of the Apes?" "My name is Jason Gridley," replied the other. "And what I have come to talk to you about will make a long story. I hope that you can find the time to accompany me to our next camp and the patience to listen to me there until I have explained my mission." Tarzan nodded. "In the jungle," he said, "we are not often pressed for time. Where do you intend making camp?" "The guide that I obtained in the last village complained of being ill and turned back an hour ago, and as none of my own men is familiar with this country we do not know whether there is a suitable camp-site within one mile or ten." "There is one within half a mile," replied Tarzan, "and with good water." "Good," said Gridley; and the safari resumed its way, the porters laughing and singing at the prospect of an early camp. It was not until Jason and Tarzan were enjoying their coffee that evening that the ape-man reverted to the subject of the American's visit. "And now," he said, "what has brought you all the way from Southern California to the heart of Africa?"